I'm glad you're back! Did you come just for the buying tips? If so, they are at the top of the post. Shown, exceptional Australian pearls from Paspaley. 1. If traveling and you find lovely pearls, don't walk away because you don't like the clasp. Buy them and have them restrung at home. A corollary: put your bucks into the pearl, you can always upgrade the clasp. But don't think you can add pearls later to make a strand longer. 2. When traveling, do not assume the pearls you are shown are local. There are many, many Chinese pearls sold in the Philippines and Japan. "Baby South Sea" pearls are usually Chinese. When in doubt ask the concierge at a five star hotel to recommend a reputable jeweler. (Just walk in and ask, you don't have to be a guest.) With some years of experience, I will still pay the 'safety tax' to deal with a reputable, established jeweler in some parts of the world. 3. Pearls displayed on black velvet look more lustrous than they are. Examine them on white or off-white board or fabric. Shop in a white or cream top. 4. Don't buy pearls with circling. Circlé (also called ringed or banded) pearls are inferior quality pearls. There are different tastes (some people like them) but if you compare prices, you will find these at the bottom, and that should be a sign. 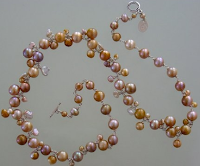 Very faint circling is acceptable on some pearls, but I would reject obvious grooves. Rather than a strand with circles on the pearls, buy a top grade single pearl pendant or earrings. 5. If the pearls you lust for are simply too pricey in the 9.5mm and up size, buy three to seven strands of smaller-sized pearls (4mm-7mm) of the same type and make a torsade. You can wear it draped or twisted, a very smart look you don't see often. Avoid the tiny rice or seed pearls (2mm-3mm), which are dated. Buy temporarily-strung 16" strands, and add at least one extra strand than you want to end up with, to make room for the twist when those strands are strung. So, for a five-strand torsade, figure an extra two inches per strand, and therefore, buy one more 16 inch temporarily-strung strand. Or you can buy finished strands and take them to your local jeweler to restring as a torsade. (Just don't forget the 'twist room'.) If you want a tight twist, figure another extra inch per strand. If price is reasonable, buy 10-15% extra for discards, as there are often some inferior pearls in the strand when you buy in Asia. 6. The grading assigned by a seller is an arbitrary standard. Unfortunately there is no uniform industry-accepted grading system. There are two widely-used systems, the AAA-A and the A-D (or Tahitian), but they may not be applied uniformly among various dealers and suppliers. Request a written description of each grading term, so that you know exactly what the grade implies. Mostly, look at pearls and build your eye. You may love an AA strand and find the AAA looks too glassy. Many pearls offered for sale have no grade attached. This is not deceptive. You can find a detailed description of pearl grades here. Lustre is the intensity of light reflected from the surface of a pearl. Look for your reflection. If it's hazy, or blurry, that's not good. But extremely lustrous pearls are not the sole criterion; the salesperson might promote lustre because that's all the pearls have going for them. Right now some jewelers are selling "mirror like" pearls. They are not to my taste. Super-lustrous pearls look too harsh to me. Lustre also varies by pearl type; South Seas have softer, more satiny luster than Akoyas. 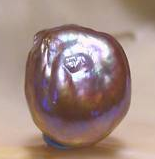 A be autiful pearl has levels of lustre, how the light refracts from the surface and a deeper, inner glow. Trust yourself, you will see that. And those are some pearls. While the oyster is making the pearl over years, life happens, even at the bottom of the ocean. Pearls can have blemishes or irregularities on the surface. Spotless pearls, like flawless diamonds, are very costly and again, imitations are nearly always spotless spheres. I can happily live with a slight cavity in the pearl surface (called a chip or pit). Avoid patchy pearls with darker, duller or lighter areas on them. A big, big factor to durability and beauty. Nacre (NAY-ker) is secreted by the oyster in layers, like multiple coats of varnish on a floor. The more layers of nacre, the more light plays through the pearl. In the last years, exposés of some major jewelers' products revealed that nacre on even very costly pearls can be perilously thin. 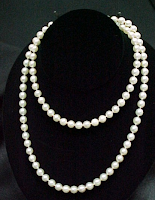 Thin nacre results in your pearls wearing down till you have dull white beads. Unfortunately there are no surefire tests for the buyer to precisely measure nacre. To check for nacre thickness, roll the pearl between your fingers. Thin-nacred pearls have a chalky, dull look and when you rotate them, show the bead nucleus through thin spots on the nacre. (These pearls are called blinkers.) Often a strand will have a couple of blinkers, so look at each pearl from all sides. If the nacre process is interrupted, the pearl develops ringed ridges. These pearls are the circlé (circled) ringed or banded pearls mentioned in the Tips. This is not a pearl variety, it is a glitch. I do not recommend buying these. 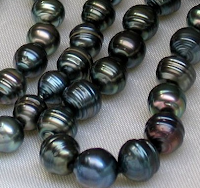 Possible exception would be a very, very faint single circle on a gorgeous Tahitian pearl. Keshi (or keishi) pearls (shown, petal-shaped keshis) are 100% nacre, and are more lustrous than the best cultured pearls, but they will never be round or even semi-round. The are found within a cultured pearl oyster, but are formed without the bead or tissue nucleus. CFWs generally have very thick nacre, but if they are not also lustrous, don't look good. French Polynesia sets nacre minimum requirements for its Tahitians, but South Sea pearls are not regulated for nacre thickness. So: thick nacre + lustre + minimal blemishes = mesmerizing gem of the sea. This term describes the uniformity of pearls. Look for a harmonious design and balanced effect. Graduated strands will be cheaper than matched strands. Intentionally mismatched pearls can be great pieces! Classic strands abound, but you don't have to buy a classic matched white strand even if it's your first purchase. If you stroll through the Passage regularly you'll know I'm a fan of these sites because they feature interesting pearls or less conventional styles. I'm impressed with their dedication to presenting unusual pearls. 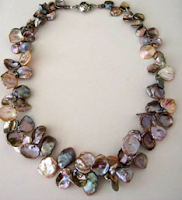 Shown, Mexican natural oyster wild pearls, $2,900. 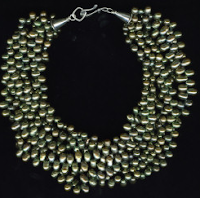 Many other very reasonably priced cultured pearls on this site. Sublime designer Zara Scoville works with 'dirty' (non-white) pearls but also some tantalizing Tahitians and Kasumis, in hip designs. Shown, dirty pearls with keshis. Sea of Cortez pearls, Mexico's emblematic gem; very special. Shown, three-pearl Sea of Cortez ring by Juan Pacheco. I hope these posts have increased your confidence and nurtured your enjoyment of an exquisite yet affordable gem. Like one rose, a single pearl delights– and there are marvelous examples within reach for the price of a pair of shoes or less. I am loving this Pearl series! I learned more from your 2 posts than anywhere else. Thank you so much. I have a Mikimoto bracelet and earring set. They were gifts from my husband and of course are special to me for that reason alone. A Mikimoto necklace would be out of reach now. I think your suggestion to look at the Hanadama line at Pearl Paradise is a good one. Thanks again for the great photos and information. Well researched! Yum. Must go put mine on. BTW, I gave your name to Geri at Fab Over Fifty. http://blog.faboverfifty.com/page/2/. New site for women in our age group. If anyone else hear fits that demographic, go take a look and say hi to Geri, the editor. What a Splurge: Those are most likely lovely Akoyas. Even so, if you ever want a change, pearls interspersed with other gems like tourmaline or aquamarine nuggets make beautiful bracelets. Not to suggest you should- it's just an idea for anyone to consider. LPC: Thanks so much, I've visited Geri and will be back, cool site. Not only did these posts make me put my pearls on, I'm fixin' for more. Thanks for this grande tour. What do you think about sets; wearing pearl necklace, earrings,ring maybe even pearl bracelet, all at the same time? I simply could never do it, never. I have also heard that sets are so out. thick nacre + luster + minimal blemishes = mesmerizing gem of the sea...says it all. metscan: I can't do it either. Two pieces are the most I could consider- a necklace and ring maybe- but would rather wear them separately. Did see a woman in an 8-row Tahitian bracelet and earrings however, spectacular. Belle: You have some beautiful pearls on your site! Imogen: Thanks; if I were in Australia I would be pearl-scouting incessantly. I really appreciated these two posts--I love pearls, but I don't know much about them. More gorgeous information. I am learning that I always thought I wanted the traditional shiny round pearls and am accepting that they are not me; well big south sea pearls perhaps...in my dreams. Thank you for all the attention you put into these posts.